Online:Ordered on weekdays before 23:30, same day shipping! Shop Arnhem: This product is available in our shop! Excellent performance for music, movies, and games. Audioengine S8 is the perfect bass extension for Audioengine powered speakers or as an upgrade to any music system. Super compact size and wireless-ready. Our S8 has an 8" custom woofer and is small enough to place in a corner or hide behind furniture. The S8 delivers great bass performance and it's low, tight, and smooth bass will blend well with the other speakers in your system. The S8 has a super-fast woofer designed for audio and home theater performance. 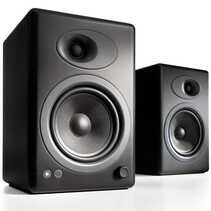 It features an anti-resonant steel frame and heavy-duty rubber speaker surround for accurate low end. The S8's bottom-firing and front-ported design means you'll hear quick, precise bass with low distortion, even at higher volume levels. In other words, this is a tight, smooth, and natural-sounding little subwoofer. Custom-designed and handcrafted wood cabinets with high-gloss white or satin black finish make the Audioengine S8 a true work of art. Cabinets are made of rock solid 1-inch thick, internally braced MDF to eliminate cabinet vibrations which means distortion-free, accurate response. If you decide to locate the Audioengine S8 away from your powered speakers or surround sound AV receiver, check out the Audioengine W3 wireless audio adapter or Apple’s Airport Express for high-quality wireless options. The S8 has a built-in AC outlet on the rear panel that’s perfect for powering these great-sounding wireless products. With plenty of continuous class A/B power, the S8 internal amplifier has a dual-voltage switch and detachable power cord. Dual line-level inputs (1/8" mini-jack and RCA connectors) are included on the rear panel so connecting S8 to all your gear is easy. And all cables you'll need are included. Variable adjustable rear panel controls for Crossover, Phase, and Subwoofer Volume allow you to easily adjust the S8's output and blending with your speakers. An auto-sleep standby feature turns the S8 amplifier off when you're not playing music. The Audioengine S8 sets a new level of audio and aesthetic quality. Even if you're not an audio enthusiast, we guarantee you will still hear a difference! Zie mijn mening van deze sub in combinatie met de Actieve speaker set AudioEngine A5+.